Founded in 2011 by entrepreneurs Allen Reagan and Walt Powell, Flix Brewhouse is the world’s only first-run movie theatre and fully functioning microbrewery. The operation faced some challenges as the business grew including a lack of of structured training program and disengaged training sessions. 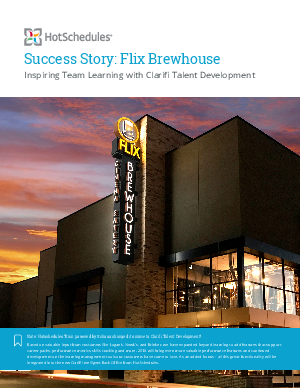 With the help of Clarifi Talent Development Flix Brewhouse was able to turn it all around. With a fully functioning training program, Flix Brewhouse now has 71 custom training courses with increased sales and improved service times. With 660 active users in their online training academy, they are able to maintain high-quality service for their customers. Learn how they do it!